The enhanced design of the play waiting areas across the RHCYP was led by design team Warren Design. Daniel and William Warren began by talking to patients. “So we took all this input,” says William, “and we started thinking about gentle, but fun, approaches we could take to the spaces. That included everything from the furniture to practical things like storage to bigger art interventions. For example: there’s one chair we designed, which is a bit like a deer, so playful, but also has a table built in which can be used for drawing or writing. And another example is the arches in the Pod space, where we worked with illustrator Emiliy Hogarth to create a imaginative ‘safe’ feeling spaces where different groups can gather, or which can become part of a gentle toddler hide-and-seek. I was asked to design and make a new window for (at that time) the new chapel space in the hospital. The brief was to make something that would appeal to people of all faiths or none, and not to include anything that was specific to any faith group. I had actually spent many hours in that very space in the early 90’s, when it was a seating area for waiting parents and visitors to the hospital with snack machines and so on. My daughter was being treated for kidney failure following an e-coli infection and it was a worrying time for our family. When creating the original window I tried to remember how I felt at that time, and what I would have liked to look at. That’s when I came up with the idea of a beautiful tree tunnel with light at the end as a symbol of hope. I remembered a specific place we used to walk in the West Highlands that looked like that, and based the design on a photograph of it taken in the 80’s. Even by the time I was making the window, the actual view there had changed due to the invasive rhododendron being cut back. The path is no longer in a tunnel but has open views out to a sea loch. The aim of the window, though, was to say that even if we can’t see the view, or perhaps cannot see any way through at all, there is always hope, there is light at the end of the tunnel. The new window is also heavily influenced by nature – the design is based on one of the tree forms towards the right-hand side of the old window. The theme is the cycle of life: cell division and new life; hopeful green shoots; healthy leaves of memory; mature, permanent branches; loss and decay. During her research, Emma was struck by how much the old window was appreciated and how important it has been to individuals over the years. Using a similar colour palette and traditional stained glass techniques would anchor the memory of the old window in the new. A series of wall graphics that were designed by artists working with patients and staff of NHS Lothian, led by Alison Unsworth, will be installed in our 200 locations in the new hospital building. The designs build on the overall concept developed by HLM architects for the interior design of the building, based on five ‘layers of the landscape’; starting with an urban theme for the ground floor, moving through themes of rural, water, mountain and sky as one travels up through the building. Alison Unsworth has created designs for wall graphics within waiting areas and treatment rooms. These will provide distraction for patients and their families whilst they wait to be seen. Each puzzle provides multiple ways for staff to engage children in conversation whilst they are receiving treatment. Alison has created drawings of familiar items that you might find in your everyday environment, including bus tickets, drinking straws, paper bags, lolly sticks and revision cards. She has combined the drawings with familiar puzzle formats to create a range of unique picture puzzles. She has also created a series of ‘repeat pattern’ puzzles with drawings of coloured and patterned drinking straws. Patients are invited to work out which straws are missing from the gaps within each pattern. Rachel Duckhouse has created designs which run along the main hospital corridors on each floor of the building and assist wayfinding by highlighting key entrances to wards and departments. She has created a visual identity for each floor by combining a repeated shape in a carefully developed range of colours, patterns and textures. Rachel combines drawing and printmaking to produce her work. These designs use the techniques of lino cutting, screen printing and block printing. Each shape has been hand printed by the artist at Glasgow Print Studio. 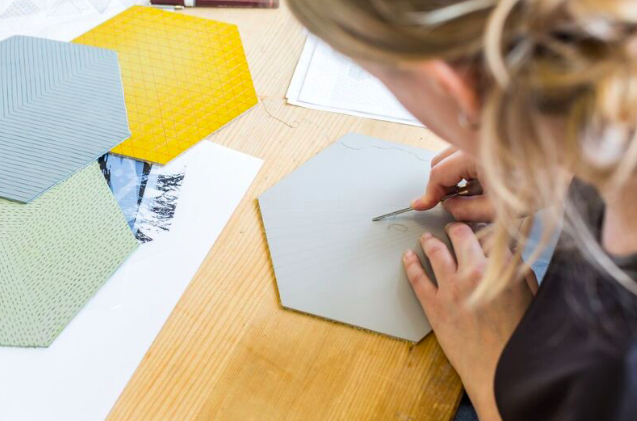 Hand production is evident throughout Rachel’s designs and imperfect edges are celebrated. Slight misalignment of individual shapes within a repeat pattern results in subtle variation of colour and texture created by overlapping areas. Artist and illustrator David Galletly has created designs for corridor walls, reception desks and staff desks within wards and departments. His work combines traditional pen and paper drawing with digital drawing, arrangement and layout. Black line drawings have incorporated one spot colour which corresponds with the landscape theme for each floor. Cityscapes of Edinburgh on the ground floor are populated by friendly giants and playful characters blowing giant bubbles. Details are revealed to the viewer as they spend time looking, with hidden elements to spot and find. On the ‘rural’ first floor David’s designs show a landscape of leaves, trees and hills populated by animal and human characters with binoculars and telescopes. Elements of the cityscape from the ground floor below occasionally appear through the rural landscape. On the fourth floor rockets and paper aeroplanes leave trails of swirling lines through the sky. Natasha Russell has created a series of illustrative artworks combining landscapes, characters and narratives, reminiscent of storybook illustrations. She uses painting and printmaking to create images by hand. On the ground floor Natasha’s designs reflect Edinburgh through patterns created from tenement buildings and characters swinging from the National Monument on Calton Hill. On the second floor Natasha has created a series of designs inspired by the theme of water, focussing on the Firth of Forth. A striking blue and white image of gannets on Bass Rock will be displayed on a corridor wall, whilst a series of eight designs will be displayed on reception and staff desks across the second floor. Each of the desks depicts a different aspect of The Firth of Forth including Cramond Island, the Isle of May, bridges, diving, swimming and microfauna. 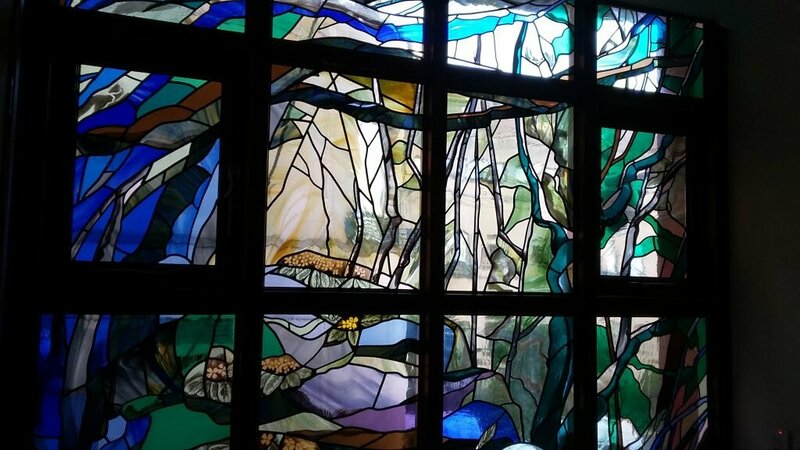 After designing and making the Sanctuary Stained Glass window for the Sciennes Road Royal Hospital for Sick Children in 1997, Emma Butler-Cole Aiken was commissioned to lead the design of the reinterpretation of the stained glass window project. The design of the new window is based on one of the tree forms towards the right-hand side of the old window. The theme is the cycle of life: cell division and new life; hopeful green shoots; healthy leaves of memory; mature, permanent branches; loss and decay. During her research, Emma was struck by how much the old window was appreciated and how important it has been to individuals over the years. Using a similar colour palette and traditional stained glass techniques would anchor the memory of the old window in the new. In the new window, interesting details and textures have been used to invite children and adults alike to look deeper. Smooth fused glass elements represent cells dividing, and intricate patterns are etched into the glass by sandblasting real leaves; the original leaf leaves its mark on the glass but is destroyed in the process. In painting the window, foliage and other items were used to print onto the glass. Whether people pass by or pause for a closer look, reflections from mirror and lustre glimmer. Building on the success of the ‘Secret Garden’ installation at the current RHSC, a team (headed by artist Alex Hamilton and Dr Oli Mival from the Napier University’s Centre for Interactive Design) have developed a projection system for forty five treatment rooms throughout the hospital which will offer up to twelve hours of tailored video projections for support and distraction whilst patients are undergoing a test, examination or procedure. The film content was selected in three different ways, firstly through an open submission opportunity whereby artists and filmmakers were invited to submit an existing short film or moving image work for inclusion in the film library. For the second strand of film library content Matt Lloyd, Director of Glasgow Short Film Festival (GSFF), selected a series of short animations from GSFF’s Family Animation Programme, while Adam Castle, Curator, ran an open call for film submissions for the film library through Edinburgh Artist Moving Image Festival networks. This film was inspired by the wide open spaces and the ever changing light of The Isle of Tiree’s beaches, and it captures some of the spirit of these special places. Jack Lockhart’s film-making process began with a walk on a beach. He used various techniques including watercolour painting, photography and video to capture images which were then brought together in a collage style using a mixture of editing and animation. Designed to be relaxing and engaging, the film has the feel of a moving painting with brush strokes giving it a handmade style. 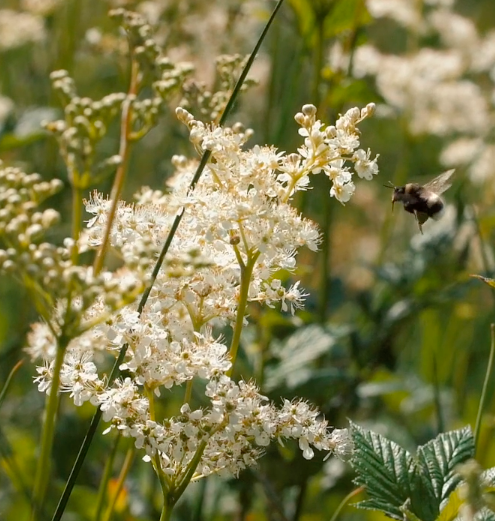 Kubik’s short film focuses on colourful, playful bees and other insects. Evoking memories of Summer time, the film is intended to be engaging for young children and bring about positive emotions. Kubik filmed insects, mostly different subspecies of Bumblebees, close up and some of the footage is played back in slow motion to capture their minuscule movements and behaviours. Kubik said of his subjects “they are cute, funny looking, calm pollinators and very enjoyable to watch”. To create their films exploring Light, Air and Water, Mohaupt and Fearnehough enlisted the help of a group of children. The children created mind maps for how to film these elements and the different ways in which they appear in nature. They were also asked to think about the ways in which these subjects could be relaxing and calming for children in hospital. For their film ‘Light’, the children came up with the words ‘sun, moon, torch, shadows, Christmas, fairy lights, sun in trees, reflections’. The artists used these words as an inspirational platform for the film. With the help of the children, the film sequences were shot during an outdoor workshop at Jupiter Artland, and the result is a film which is both eye catching and engaging. Nim Jethwa’s short film was created to help patients at the RHSC to engage during procedures. Jethwa uses a tilt shift technique in order to capture a unique ‘toy town’ perspective of the everyday goings on in the city of Edinburgh. The film was shot over seven days in late November from various vantage points in and around the city. No drones were used, instead the artist obtained access to the vantage points from various organisations and companies who were very willing to help. Jethwa described the filmmaking process as an “opportunity for me to explore the wonderfully multi-layered city”. The musical composition was created specifically for this film by Bristol musician Jilk. The benefits of the outdoors are well documented, and users of the new RHSC and DCN will have access to 18 of the courtyards and terraces around the building. Working with HLM Architects this project will enhance these spaces to make attractive retreats where patients, families and staff can enjoy fresh air and nature, with different spaces set aside for peace and reflection, social interaction and play activities. A flexible exhibition wall display system will be created. The new hospitals will contain two areas for changing exhibitions, these include the main DCN Outpatients corridor and Pod Atrium space. A Snoezelen room is a controlled multi-sensory environment which is specially designed for sensory therapy. The new RHSC Snoezelen room has been developed by Southpaw and offers multisensory stimulation that can be easily adjusted to range from soothing to stimulating depending on need.